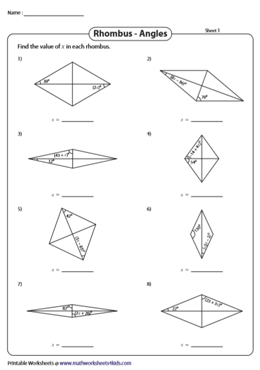 Learn about angles and the special properties of a rhombus with our well-rounded collection of geometry worksheets. Get ample practice on key topics like find the indicated angle, solve for the value of x and a lot more. 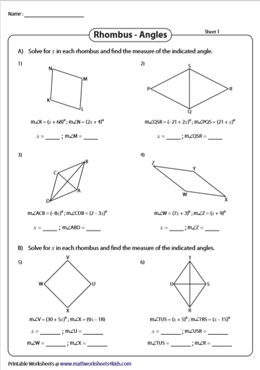 Utilize this batch of printable worksheets to gain practice in solving linear equations. 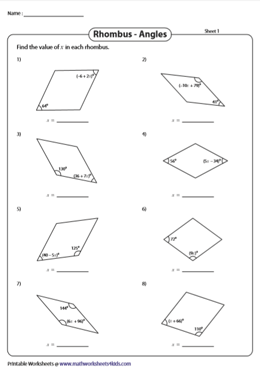 Recall the properties of the rhombus to determine the unknown angle measure in this set of printables. Students are required to find either the opposite angle or the adjacent angle of each rhombus in part A and all the missing angles in part B. Verify your answers with the corresponding answer key. 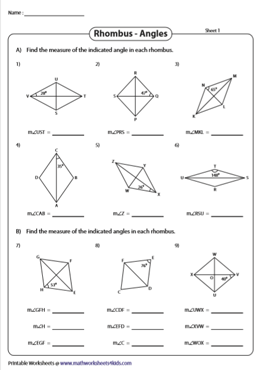 This collection of worksheets is based on the properties - the diagonals of a rhombus bisect each other at right angles and the diagonals bisect the vertex angle through which it passes. Figure out the indicated angle measure of each rhombus. High-school students can put their equation solving skills to test here. Incorporate the properties of the rhombus to set up an algebraic expression with the given vertex angles and then solve for x. 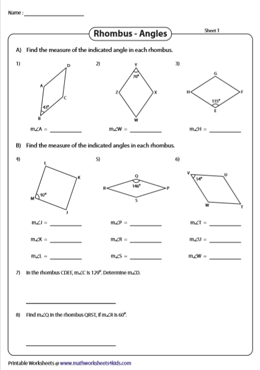 Packed with worksheets, this section provides easy algebra practice to high-school students. Interior angles are either algebraic expressions or whole numbers. Set up an algebraic equation and solve for x. Use the properties of opposite, adjacent and alternate interior angles of a rhombus to solve each problem involving algebraic expressions. Substitute the value of x and find the indicated angles.